Developers can use Jetson AGX Xavier to build the autonomous machines that will solve some of the world’s toughest problems, and help transform a broad range of industries. Millions are expected to come onto the market in the years ahead. Consuming as little as 10 watts — about as much as a clock radio — the module enables companies to go into volume production with applications developed on the Jetson AGX Xavier developer kit, bringing next-gen robots and other autonomous machines to life. 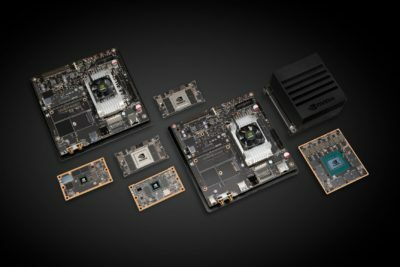 The Jetson AGX Xavier module leverages NVIDIA’s world-class AI platform, which is used for numerous AI applications. This includes a complete set of tools and workflows to help developers quickly train and deploy neural networks. It supports applications developed with the JetPack and DeepStream software development kits. JetPack is NVIDIA’s SDK for autonomous machines and includes support for AI, computer vision, multimedia and more. With this combination of new hardware and software, it’s now possible to deploy AI-powered robots, drones, intelligent video analytics applications and other intelligent devices at scale. It’s central to handling DNA sequencing in real time for Oxford Nanopore, a U.K. medical technology startup. And Japan’s DENSO, a global auto parts maker, believes that Jetson AGX Xavier will be key to helping it introduce a new wave of efficiency into its operations.